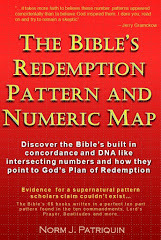 New Discovery: Bible numbers and its numbering is God given: Watch the 66th verses of every book of the Bible. #66 is related to sin/evil. Most often things done wrong. Watch the 66th verses of every book of the Bible. #66 is related to sin/evil. Most often things done wrong. Just a quick post about the perfect numbering of the Bible. We know #6 is related to sin and crossing over to God by repenting (turning away from sin). The 5th book of the Bible is Joshua which accounts for him leading the people across the Jordan into the promise land. His job was to remove strongholds of sin in the land - which they did not complete. Number 66 is a multiple of 6 which makes it about things about a greater intensity of sin. To demonstrate this, I've included below a selection of the 66th verse of some books of the Bible. I've not included every 66th verse as some are examples more difficult to discern. Nonetheless, these list of 66th book-verses provides compelling evidence for the symbolism of God's number 66. Judg 3:7 And the children of Israel did evil in the sight of the LORD, and forgat the LORD their God, and served Baalim and the groves. Zech 5:8 And he said, This is wickedness. And he cast it into the midst of the ephah; and he cast the weight of lead upon the mouth thereof. Matt 4:1 Then was Jesus led up of the spirit into the wilderness to be tempted of the devil. 1Joh 4:3 And every spirit that confesseth not that Jesus Christ is come in the flesh is not of God: and this is that spirit of antichrist, whereof ye have heard that it should come; and even now already is it in the world. Exo 3:19 And I am sure that the king of Egypt will not let you go, no, not by a mighty hand. Jer 3:10 And yet for all this her treacherous sister Judah hath not turned unto me with her whole heart, but feignedly, saith the LORD. 1The 5:5 Ye are all the children of light, and the children of the day: we are not of the night, nor of darkness. Josh 4:7 Then ye shall answer them, That the waters of Jordan were cut off before the ark of the covenant of the LORD; when it passed over Jordan, the waters of Jordan were cut off: and these stones shall be for a memorial unto the children of Israel for ever. Psa 7:10 My defence is of God, which saveth the upright in heart. Mrk 2:21 No man also seweth a piece of new cloth on an old garment: else the new piece that filled it up taketh away from the old, and the rent is made worse. Philp 3:6 Concerning zeal, persecuting the church; touching the righteousness which is in the law, blameless. 2Kin 3:23 And they said, This is blood: the kings are surely slain, and they have smitten one another: now therefore, Moab, to the spoil. Bible's Symbolism #23 = God With Us; "where 2 or 3 are gathered, I am in their midst"
Learn about the Bible's Numbers -- #41 is about Jesus, the LORD God, the judge, redeemer and savior. Hidden transitions in the text at the exact 1000th verse locations in Bible books. Does the 8.8 magnitude earthquake on Feb 27th have a message from God? Copyright 2009-2014 Norm Patriquin. Simple theme. Theme images by gaffera. Powered by Blogger.